Day 1 of Every Day in May 2015 is supposed to be a favorite food and although I do enjoy the occasional burger, ground beef isn’t really a favorite eat…but this vacuum-sealed package of defrosting-as-I-drew meat was certainly a favorite to draw. 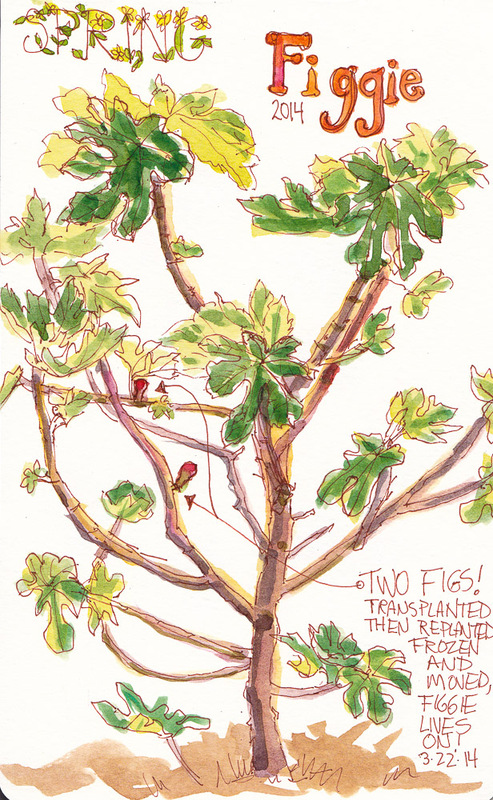 Day 2’s cue is “A nearby tree” and my next-door neighbor’s adorable little baby flowering cherry called out to be drawn before the puffy flowers fall. I meant to fit the whole tree on the page but I started in ink with the top left branch and drew too big so only the top left side of the tree fit. Oh well. It felt so good to just draw for fun in my sketchbook again after weeks of working on two commissioned paintings that are finally approaching completion. 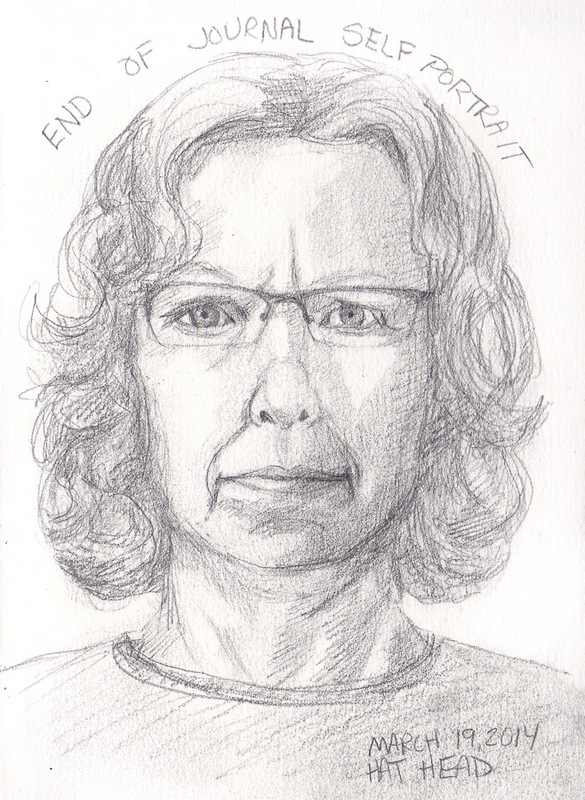 I needed to get back to playing in my sketchbook again, whether the paintings were finished or not, so EDiM came along just at the right time. For me, it will probably be more like Every-ish Day… or (Almost) Every Day… or Some Days in May since I have a lot of other things going on this month. However many days it is, any day that I get to draw is a good day! If you want to join in the fun, check out the Facebook Group or the Flickr Group and click to join. Everyone is welcome to play any time during the month. This was one of the those magical paintings that just worked from beginning to end. Maybe it was painting on Gessobord, which I love, or maybe it was because I tried to stay really focused. It’s available here on Daily Paintworks. 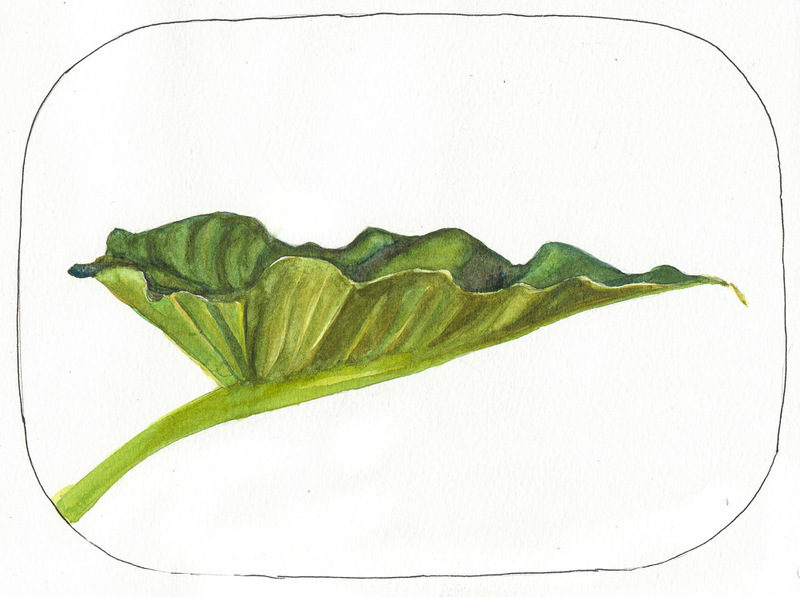 I was careful to paint the string beans from the garden and their leaves first since I knew they would change quickly. I stopped when I found myself getting tired or losing focus and took a break. And I closely followed my pre-planned goals for each session. See my session chart for Persimmon and String Beans (pdf) with all the steps, plans and session images or see the images of the steps below without details. One new step I added this time was studying the nearly finished painting in Photoshop on a large screen before declaring it finished and then finding and noting areas that needed adjustments, including completely changing the background value at top. Let me know if you’re finding these charts or step by steps interesting. I do them for myself but if others find it interesting it’s worth posting them. 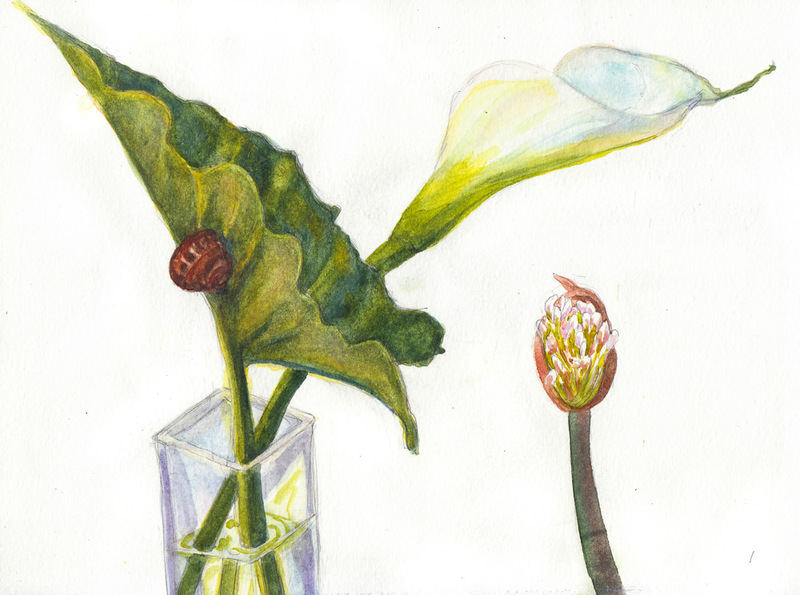 I spent some time sketching and painting a calla lily that sprouted in my garden and while I was at it, tested a palette of Winsor Newton Cotman paints. Several of my friends have this clever, inexpensive Winsor & Newton Cotman Sketchers Palette and I thought it was worth a try so I ordered one. 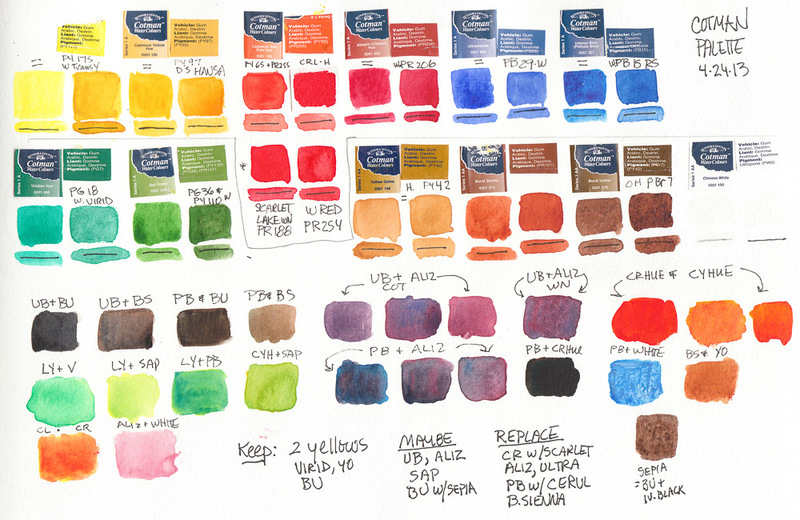 I started by testing the colors, listing the pigments to match them to artists’ quality pigments I normally use (click to see larger with pigment numbers) and making notes about which ones to swap out (at that point assuming I’d continue using the others). I was very frustrated with the results I was getting when painting and in the end, took ALL the Cotman pans out of the palette and replaced them with pans filled with artist quality paints from tubes. I put the Cotman pans in a large jar of water to soak so that I could empty and reuse the empty pans. After dumping and refilling the jar many times I ended up with a jar of tinted water with a lot of white sandy junk at the bottom: the nasty fillers and binders added to the pigments to make it cheap. I liked the drawing above, but not the grayed colors. I liked the shape of the leaf above. 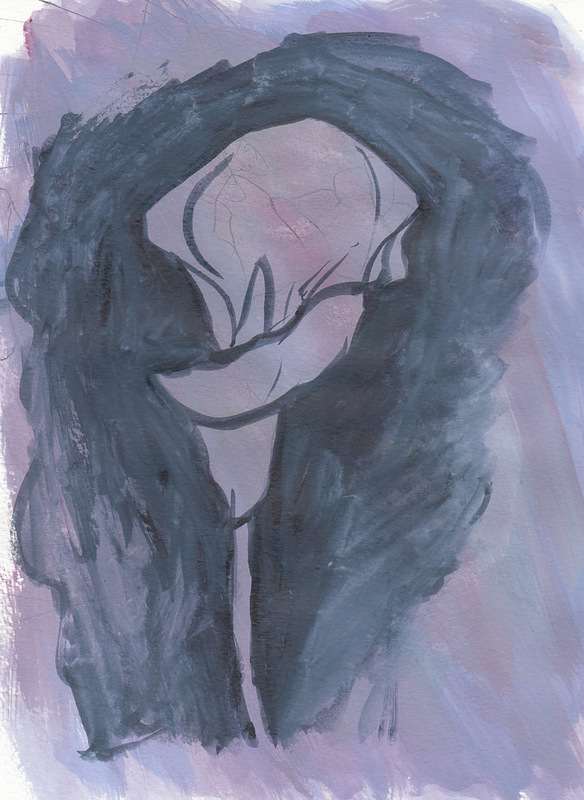 I painted over an awful sketch with gouache (above), just loosely trying to get the shape of the flower. 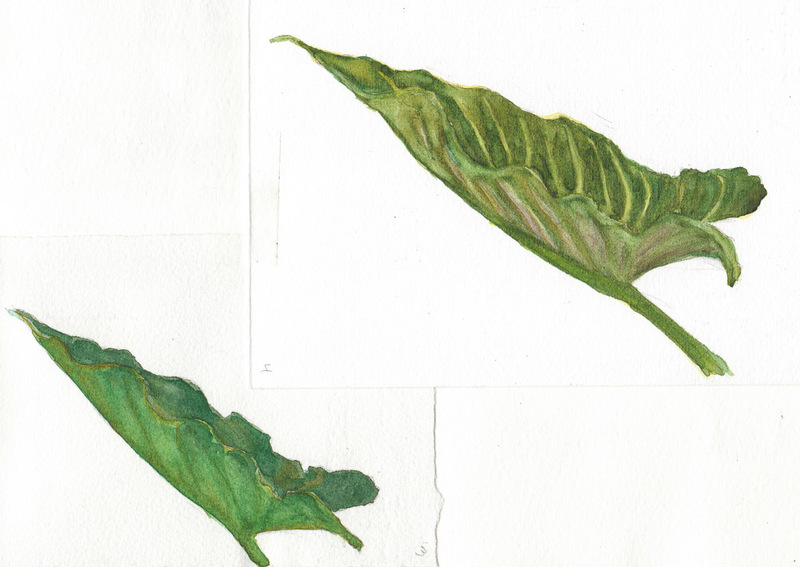 Two previous attempts at the leaf, on 2 other kinds of paper I taped into the 8×10″ Moleskine. The first sketch. I like the composition but the colors and application were yuck. 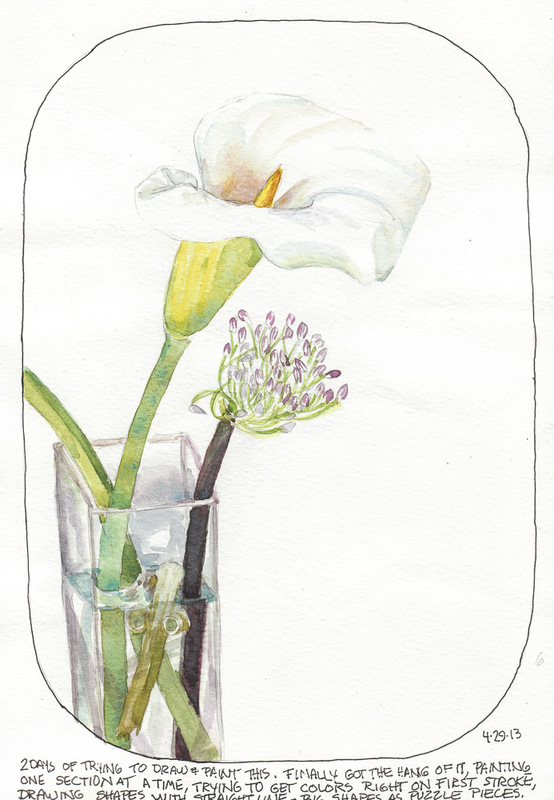 I’m still using the Cotman Palette. 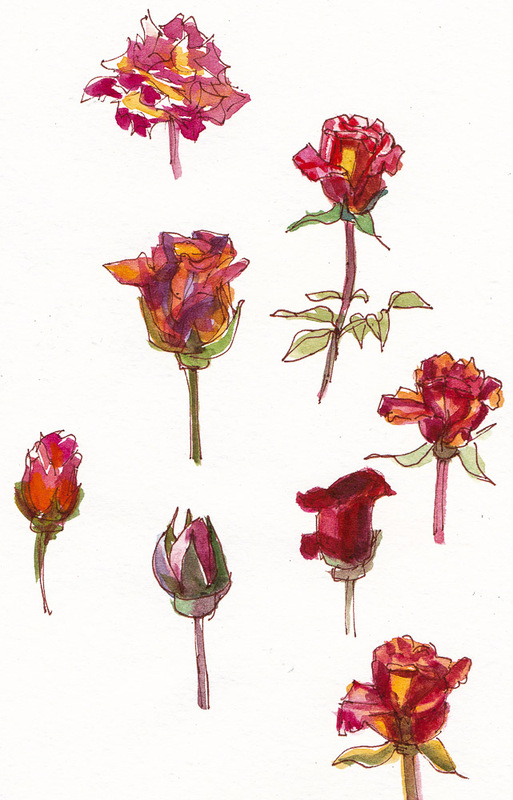 I think it’s a great for sketching because it’s light, compact and holds enough colors (12). And at $17 I don’t mind the price, even after throwing away the colors it cane with. It’s handy to have the now-empty, extra half-pans which usually cost about 50 cents each. So really, I got the palette for $11, and 12 empty pans for $6. Not too bad. 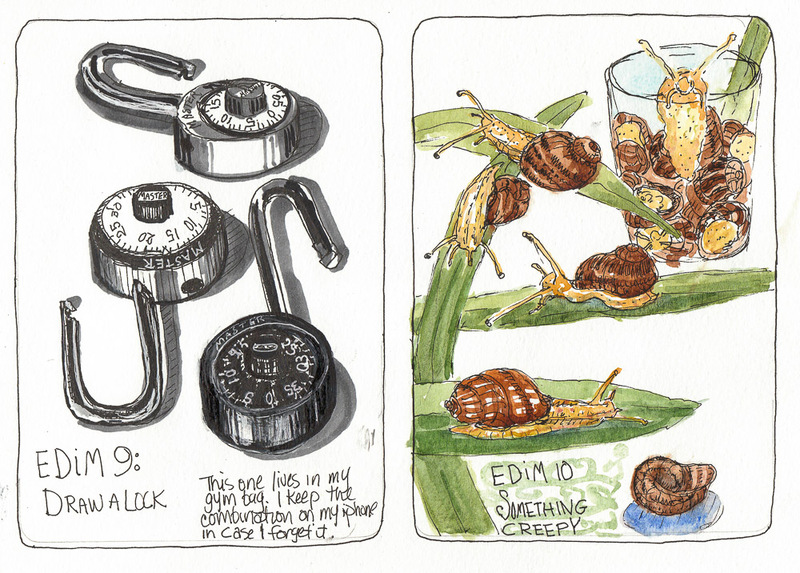 The creepiest things around my house are snails and slugs. They creep along, leaving their silvery trails of slime. Yuck. My gardeners warned me that the big Agapanthus plants left behind by the former owner of my home were snail havens and wanted to remove them. But I like the crazy purple flowers and left them. 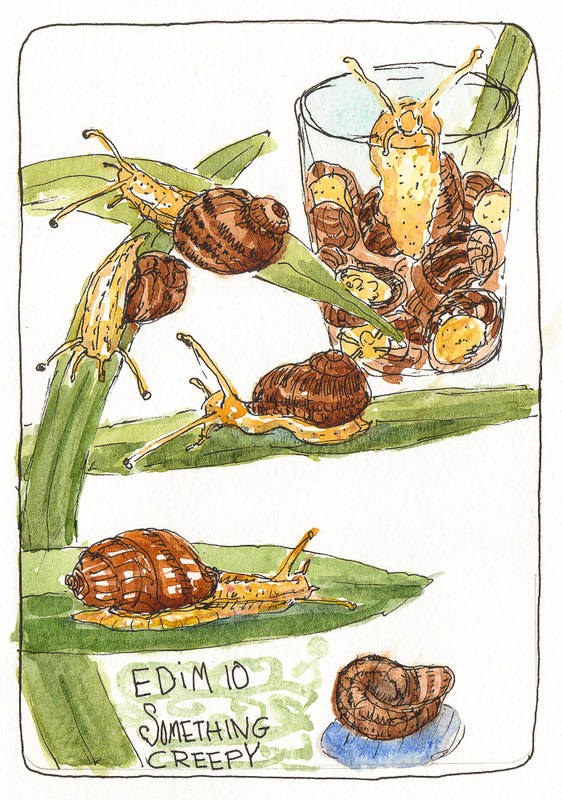 To collect snails to sketch I knew where to go: I filled a plastic cup from two Agapanthus. Most of the snails curled up in their shells and hid. One was very curious and climbed onto a leaf I stuck in the cup. I put the leaf and snail on the table to draw but he was a busy guy so I had to keep moving him when he reached the end of the leaf. Then I put him in the cup and he started climbing up and over the side, giving me a clear view of his face, which was just a little nub, with no apparent eyes or mouth. Extremely creepy. The lock above is one I’ve had for many years. It lives in my gym bag and even though I sometimes go long stretches without using it, I seem to always remember the combination. I keep the combination in my iPhone’s contact list just in case I forget. I don’t want to be stranded in the locker room! I struggled a bit drawing the lock so did it several times, starting with the one at the bottom. Even though I didn’t see eyes or mouth it turns out they have them. Their weak eyes are on the end of their tentacles, the mouth is underneath the head. They don’t have ears and can’t hear but have a good sense of smell (though no nose). Lots more interesting snail facts on Snail World.com.